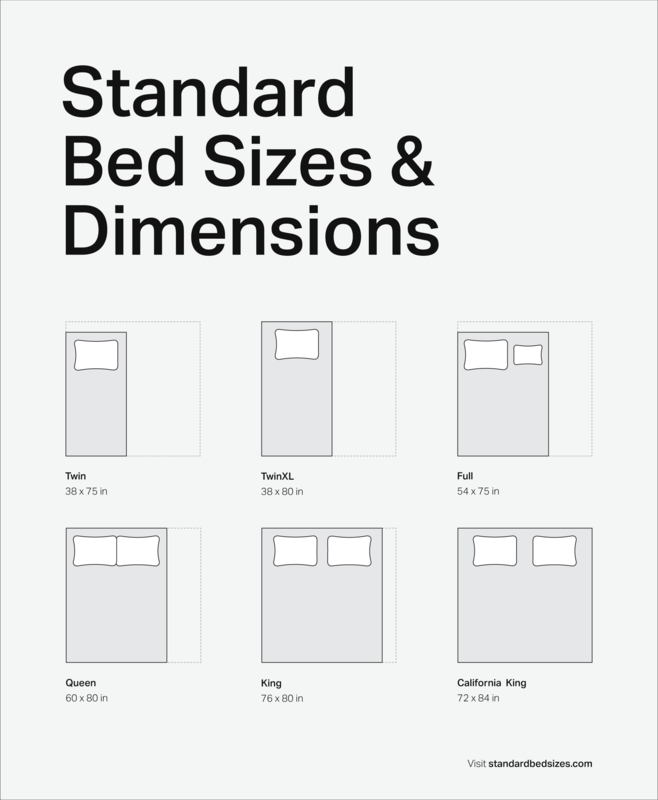 An overview of common bed dimensions and mattress sizes. A twin size mattress measures 38" x 75" and is suitable for a single sleeper. This bed is ideal for one child, teenager, or small adult. Its dimensions are perfect for smaller rooms and studio apartments. A twin XL mattress provides enough sleeping space for one individual. Its dimensions are 38" x 80", which makes it a good choice for a single, tall sleeper. An XL bed is great for guest rooms or smaller bedrooms. The dimensions of a full (or double) mattress are 54" x 75". This bed size can sleep two small adults without pets. It is also an ideal size for a single adult who sleeps with pets. A Queen mattress measures in at 60" x 80", which is a good size for one adult with pets or two adults without pets. This bed offers more room than a full if you have a partner or larger animals. A standard king mattress measures in at 76" x 80". With a larger width, a king bed is ideal for a single adult with pets and/or children, or for two adults with a child or large pet. A California king mattress is 72" x 84", which is great for an adult who enjoys having extra sleeping space with multiple children or pets. It is also provides ample room for two adults with multiple children or pets. Purchasing a new mattress is a huge decision — and one size definitely does not fit all. Before buying, it's important to figure out which bed is best for your sleeping habits and space. You should consider your preferred sleeping position, height and weight, a partner, the number of pillows you use, and how much personal room you like. Also, you may want to consider adding extra room for pets or children jumping in the bed. To help you choose the best bed size, see the list of mattress dimensions and descriptions below.